Sailmakers Place has the best of everything for family gatherings. 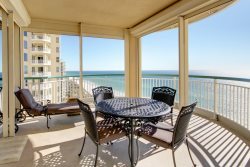 This 3100 SF Penthouse has endless views of the Intracoastal Waterway from two large north balconies and views of the Gulf of Mexico from the south balcony. The spacious interior has ample room for entertaining and relaxing. The unit is a two-story townhouse with separate entrances from the 9th and 10th floors. Upstairs has an open, airy floor plan with large kitchen, dining, living area, master bedroom and private bath with separate garden tub and shower and double vanities, bar-entertainment area and half bath. Downstairs has 4 additional bedrooms and full baths and laundry. Electronics include 42 in TV in Living Room, 32 in TV in upstairs master, 32 in TV in downstairs master, 24 in TVs in 3 downstairs guest bedrooms. The Staff at Perdido Realty sets the tone of my dream vacation all.the.time. They are very friendly and act as GREAT hosts, their goal is to make sure our visit and stay exceeds our expectations from beginning to end. Val and Micheles dedication to customer satisfaction trickles down to the staff including those that works behind the scenes like the Maintenance, Housekeeping and A/P team. I know this because it shows on the smallest detail -extra towel, spare light bulb and flashlights in the unit goes a long way. I have never had to call for any hidden charges on my credit card unlike other all-inclusive resort we stayed at. Perdido Realty is the best on the coast! The Perdido Realty Team is awesome! Our reservation, check-in and check out was so easy. Sailmakers 903 was the absolute best! Our family celebrated our Thanksgiving Holidays here and we had so much fun. Everyone had plenty of room. The kitchen/living/dining area made is so we could cook, visit, play games, and enjoy the view all at the same time. We hope to make this an annual tradition. The sunsets were breathtaking. We could not have asked for anything better. Thank you Perdido Realty Team! YOU ARE GREAT!! Keep up the good work!